Reference number for this case: 16-Oct-54-Obersaasheim. Thank you for including this reference number in any correspondence with me regarding this case. An article in the regional newspaper Les Dernières Nouvelles du Haut-Rhin, page 7 of the bilibgual issue, for October 19, 1954, wondered: "Was it a flying saucer?" "Obersaasheim. -- Saturday around 07:30 p.m., two girls aged 13 and 14, E. L. and S. A. saw suddenly, passing the town hall, a bright ball of light green color." "It was about the size of a child's balloon. From the south, it was heading at high speed towards the east." "After about a minute, the ball, which was a tail of the same color had disappeared." Was it a flying saucer? Obersaasheim. -- Saturday around 07:30 p.m., two girls aged 13 and 14, E. L. and S. A. saw suddenly, passing the town hall, a bright ball of light green color. It was about the size of a child's balloon. From the south, it was heading at high speed towards the east. After about a minute, the ball, which was a tail of the same color had disappeared. Among briefly mentioned cases for this date, he indicates that on October 16, 1954, at 07:30 P.M., in Obersaasheim, two young girls have seen a green ball followed by a green tail, coming from the south and going towards the east. 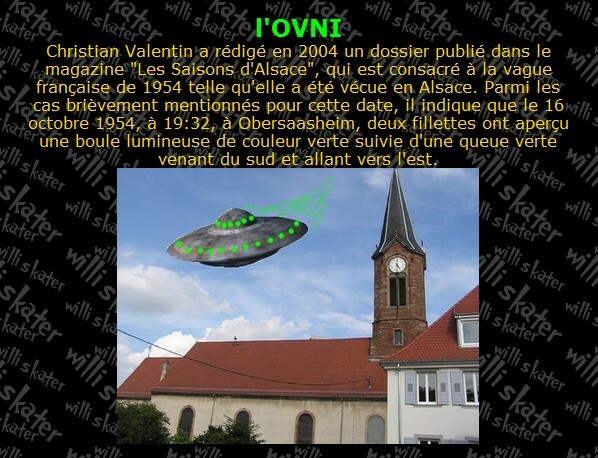 In 2004, Christian Valentin wrote a dossier published in the magazine "Les Saisons d'Alsace", which was devoted to the French flap of 1954 as it was lived in Alsace. Among briefly mentioned cases for this date, he indicates that on October 16, 1954, at 07:30 P.M., in Obersaasheim, two young girls have seen a green ball followed by a green tail, coming from the south and going towards the east. Obersaasheim: Saturday around 07:30 p.m., two girls aged 13 and 14, E. L. and S. A. saw suddenly, passing the town hall, a bright ball of light green color. [dh1] "Etait-ce une soucoupe volante? ", article in the regional newspaper Dernières Nouvelles du Haut-Rhin, page 7 of the bilibgual issue, France, October 19, 1954. 0.1 Patrick Gross April 19, 2005 First published. 3.0 Patrick Gross May 1, 2014 Additions [dh1], [ws1], [cv2], Summary. Explanations changed, were "Not looked for yet. Probable meteor" previously. This page was last updated on May 1, 2014.